Horseback Riding is great outdoor exercise with a purpose! Don’t believe us? Come try it for yourself! We offer an Introductory Lesson every Sunday at 1pm. All that is required are long pants, closed-toed shoes and a sense of humor. That’s it! No pressure, no sales pitch. We genuinely just want you to try it because we know you are going to enjoy yourself and then hopefully you will tell your friends. $20 per person fee. Refundable upon sign up of Lessons or Camp within 30 days of your Intro Lesson. Please arrive by 12:30 to fill out waivers and get fitted for a helmet. NOTE: Due to the popularity of our Introductory lesson, we reserve the right to ask you to come back on another Sunday if you arrive after 1:05pm. Thank you. 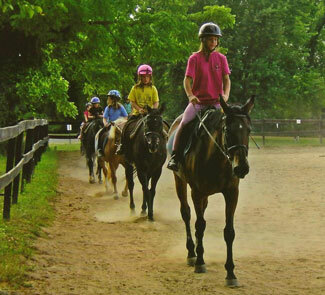 ANOTHER NOTE: The Introductory Lesson is open to individuals who are interested in attending our camps, after school program or our riding lessons. This is not a weekly lesson. It is intended for folks to try one lesson before enrolling in our lesson program or camp. All children under the age of 18 must be accompanied by their parent or an authorized care taker.